I dye silk, cotton and other natural fibers using a variety of techniques with fiber reactive dyes. These include immersion dyeing, dye-painting, block printing and monoprinting. I call this “expressive” dye-painting, giving credit to the Abstract Expressionist painters who have influenced my approach. 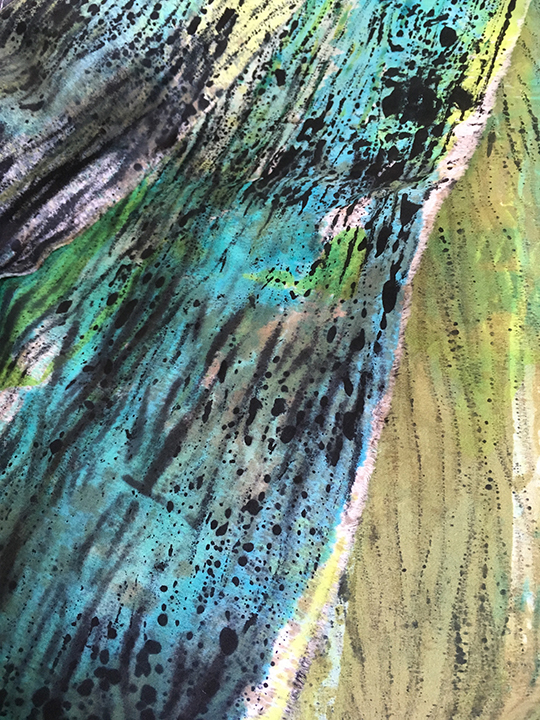 Some works are further layered with drawing, painting and monoprinting with metallic and opaque fabric paints. I also collect vintage, retro, and recent textiles that I recycle in my work. These are the “found” fabrics referred to in my medium descriptions. I am always on the lookout for the perfect 1980’s silk dress or blouse to deconstruct and reuse. These textiles have stories to tell in themselves, give a nod to quilting tradition and provide the works with a time and culture stamp. In my book, there is almost nothing that a trip to a thrift store won't cure! I collage the fabrics on what I call a "quilt canvas." This allows me to freely cut, layer and build the image, most often using a fusible glue. I refer to this as "fused collage." I heavily stitch through all layers, quilting by machine to add another layer of drawing, pattern and texture. In the end, these works have the traditional structure of a quilt: backing, batting and top (the collaged surface), with a depth of about .25 inch. This is the construction method of most of my works unless otherwise noted.. Thread, batting, and backing fabric are not repeatedly listed in each medium description of the quilted works. 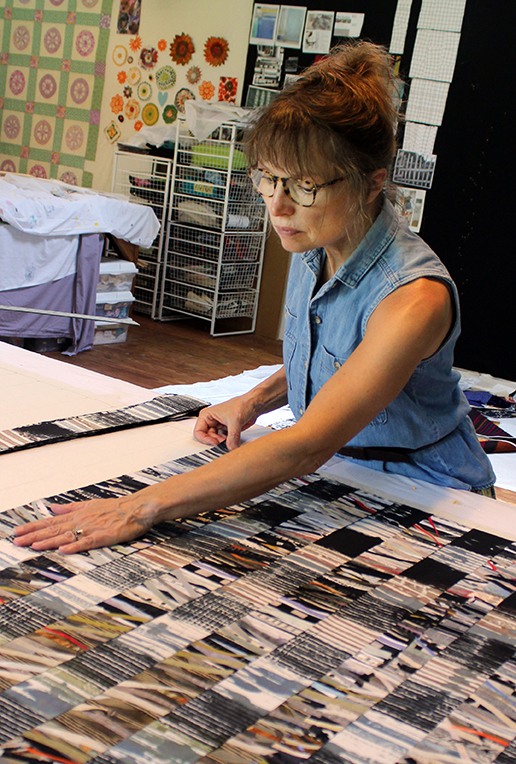 These works are assembled in a variety of ways including fusing, serging (overlock stitch), and machine stitching. They are often airy and two-sided, with stitching in the voids. I am always looking for new ways of using fabric, thinking about its essential qualities and how I can develop new forms. Assembling strips of dyed, fused silk for Tall Grass I quilt textile. All images and content ©Sue Benner. All rights reserved.